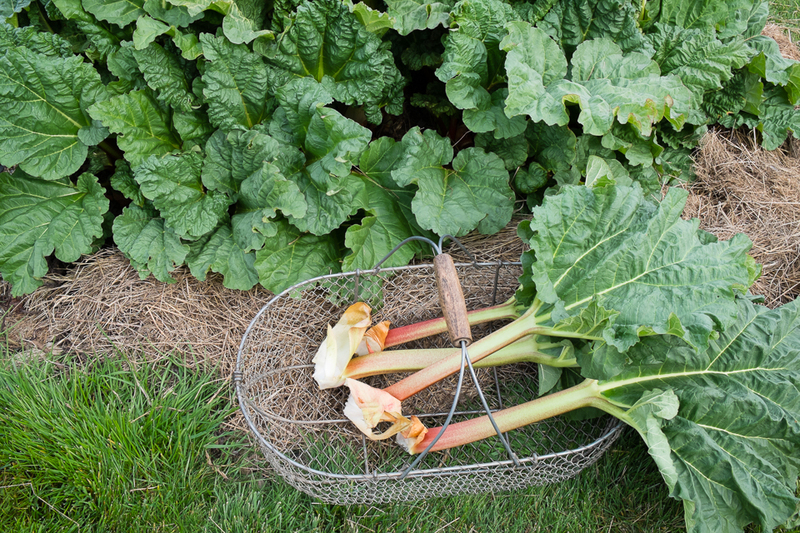 Rhubarb grows so quickly, exploding from the ground, shooting up stalks, billowing out foliage, all in a few weeks. It leaves other spring perennials, asparagus, artichokes, strawberries, far behind. But this rapid growth is good; it means pies and sauces sooner. 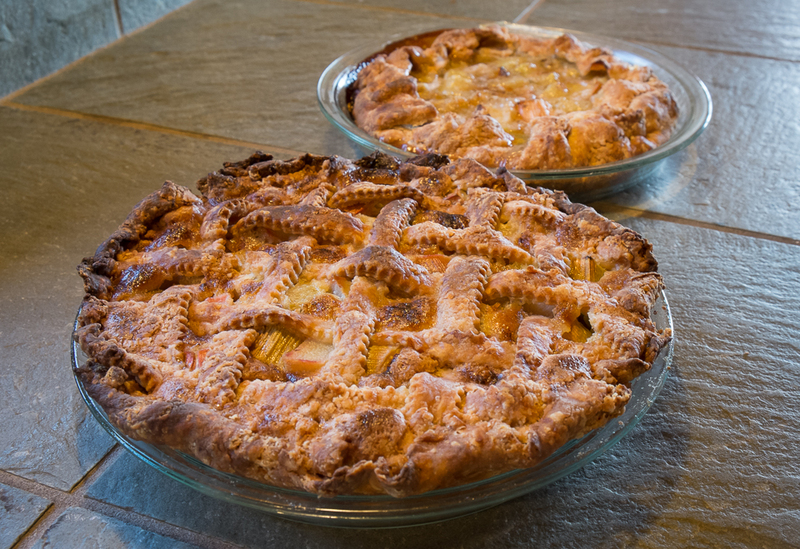 We are a two-pie family when it comes to rhubarb. 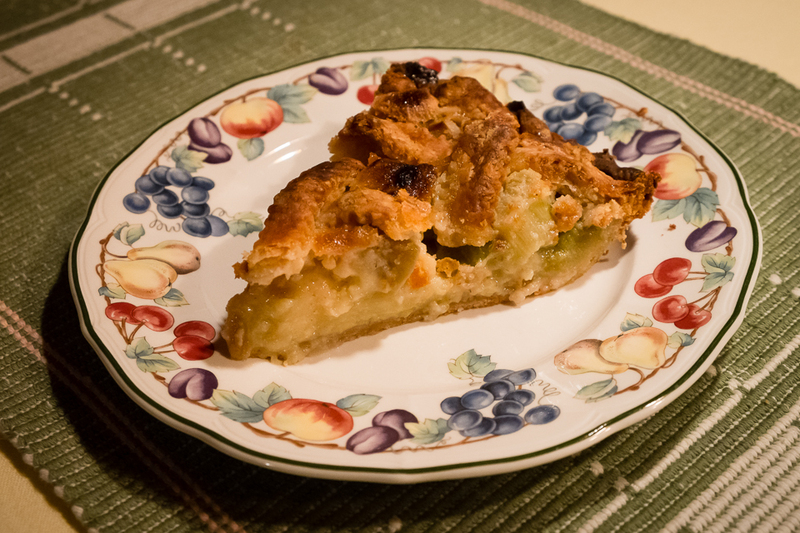 Scott prefers rhubarb custard lattice-top pie while I’m partial to plain rhubarb pie, either two-crust or galette style. I’ll often make one of each and we’ll sample each other’s favorite but have seconds of the one we like best. Both recipes I use are from the Better Homes and Gardens New Cookbook, 1973 edition. I’ve used the excellent pie section so often that the pages are falling out. Mix 1 and ½ cups sugar, ¼ cup all-purpose flour, ¼ teaspoon ground nutmeg and a dash of salt. Add to 3 beaten eggs; beat smooth. 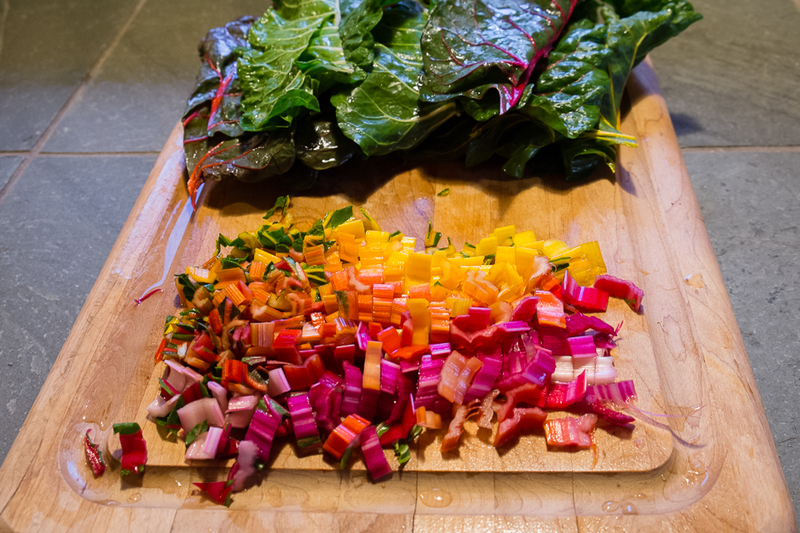 Stir in 4 cups 1-inch slices rhubarb. Prepare pastry for 9-ince lattice-top pie. 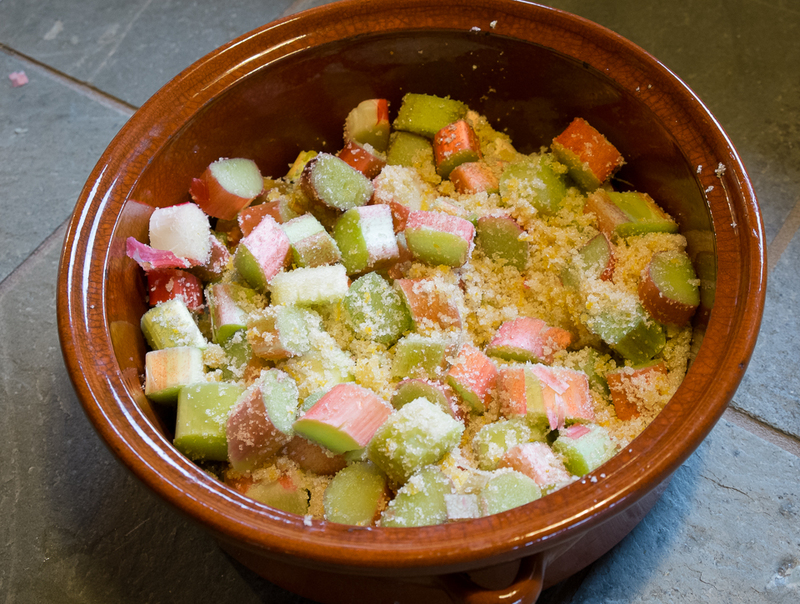 Fill with rhubarb mixture. Dot with 2 tablespoons butter. Adjust lattice top; seal. Bake at 400 degrees for 50 minutes. 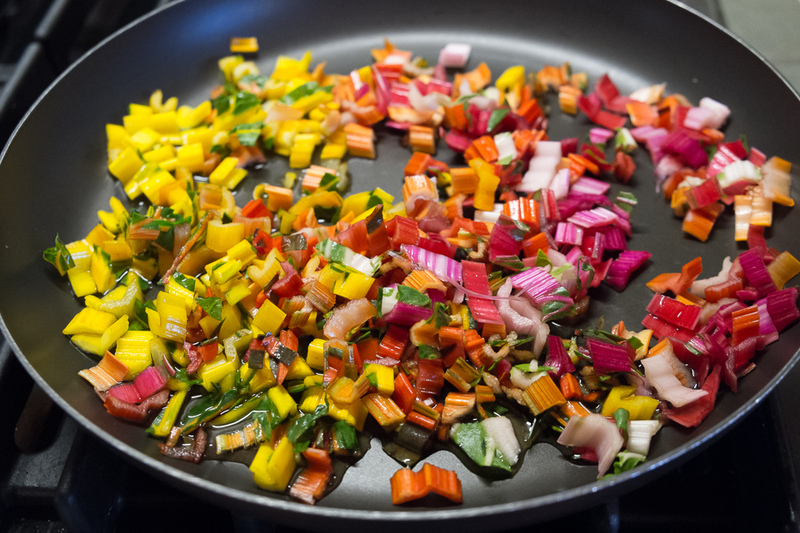 Combine 4 cups 1-inch slices rhubarb, 1 and ½ cups sugar, 1/3 cup all-purpose flour and dash of salt; let stand for 15 minutes. Prepare pastry for 2-crust 9-inch pie; line 9-inch pie plate with rhubarb mixture. Dot with 2 tablespoons butter. Adjust top crust, cutting slits for escape of steam; seal; flute. Bake at 400 degrees for 50 minutes. In this season of abundant rhubarb, pie is for dinner, or even lunch but for breakfast I like rhubarb sauce with plain yogurt and granola. Several years ago I discovered Nigella Lawson’s rhubarb sauce recipe that calls for baking rather than boiling the rhubarb with sugar and grated orange rind and it’s the one I’ve used ever since. 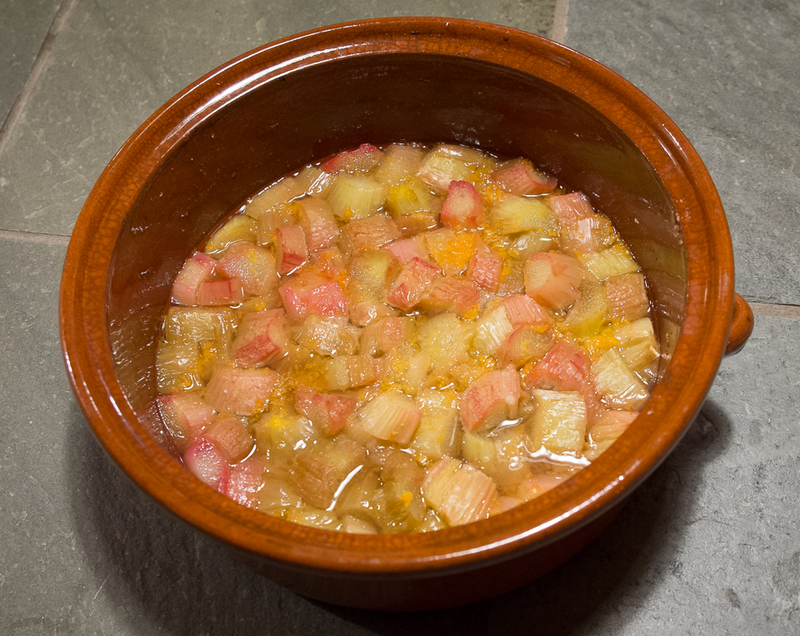 For two pounds of sliced rhubarb, add 1 or 1 and 1/3 cup sugar, depending on your sweetness preference, and the grated rind of one orange. Bake, covered, at 375 degrees for 35-45 minutes until soft but not mushy. 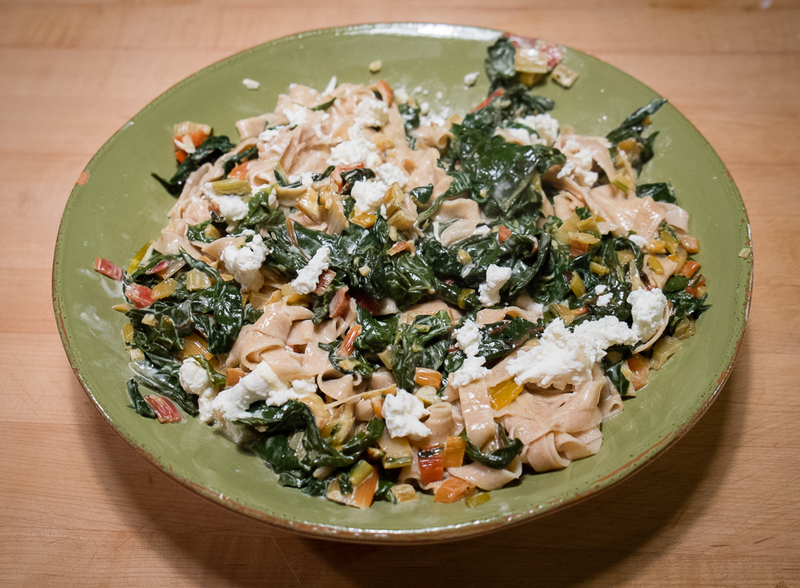 I’ve sometimes substituted candied ginger for orange rind or simply left out the flavorings. All variations are delicious. 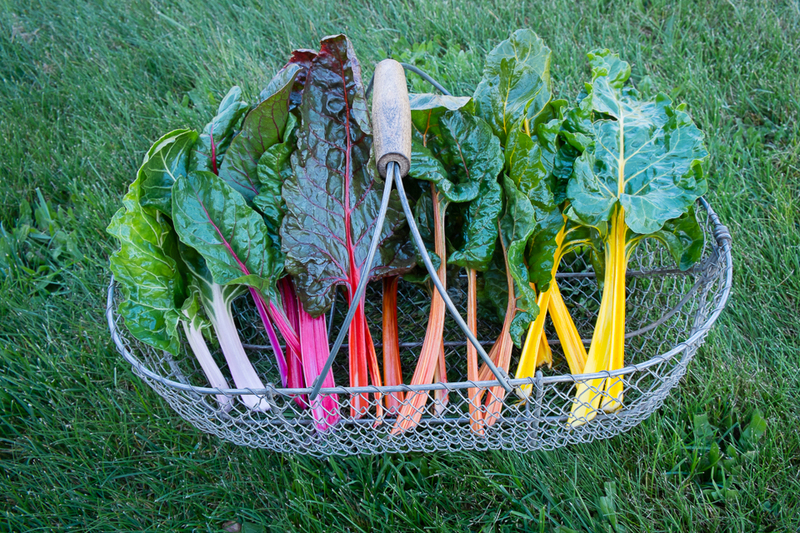 The rhubarb in my current clump is from starts friends in eastern Washington gave me. An unnamed variety, it’s the best rhubarb I’ve ever grown. The light pink stalks are tender and flavorful, needing less sugar than some of the darker red varieties I’ve grown in the past. And it stays lush well into late summer with only moderate watering. Our daily indulgence in rhubarb will no doubt wane as strawberries, raspberries and blueberries come in but until then, it’s the best thing on offer and we’ll eat our fill. The few remaining winter crops are putting on a showy display in the kitchen garden right now. 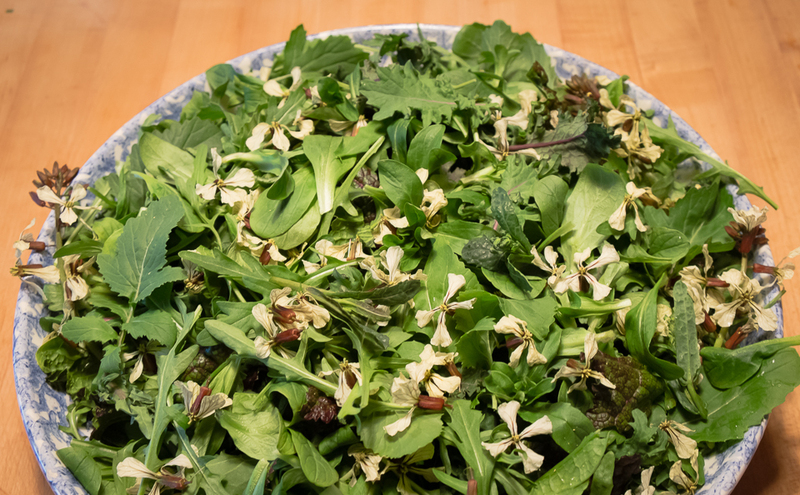 The tough stalks and stems of Brussels sprouts and red cabbage have sent out tender, broccoli-like buds and the overgrown arugula is topped with creamy white, four-petal blooms. I could have pulled these plants out weeks ago, but I left them in place, both for their beauty and for their taste. Brussels sprouts always surprise me this time of year with bright new growth bursting out along scarred stalks. Cabbages send out buds too, just below the point where the heads were cut. 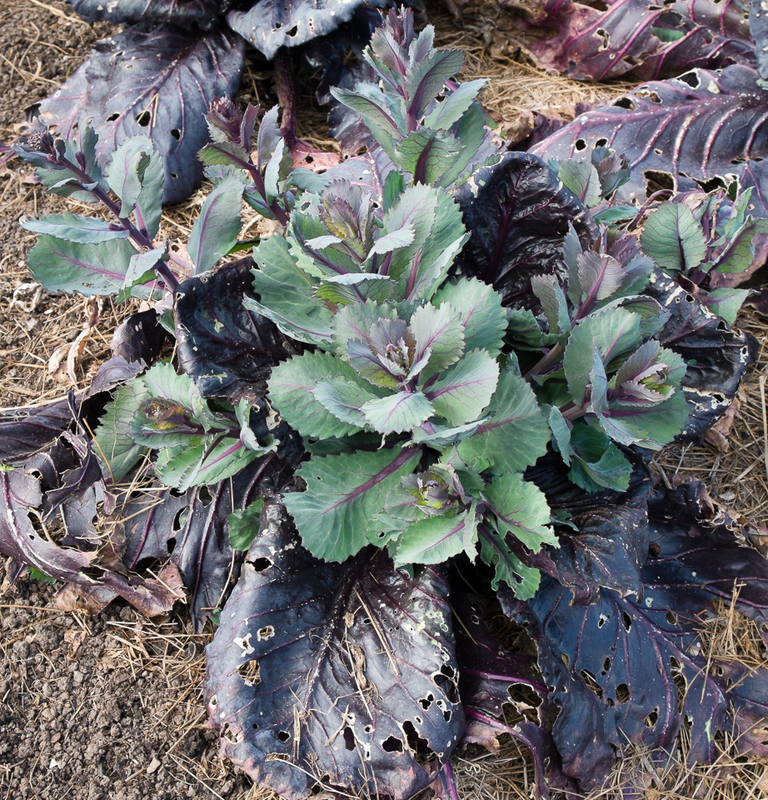 The red cabbage buds are especially pretty this year, blue green tinged with purple rising above the tattered winter leaves. 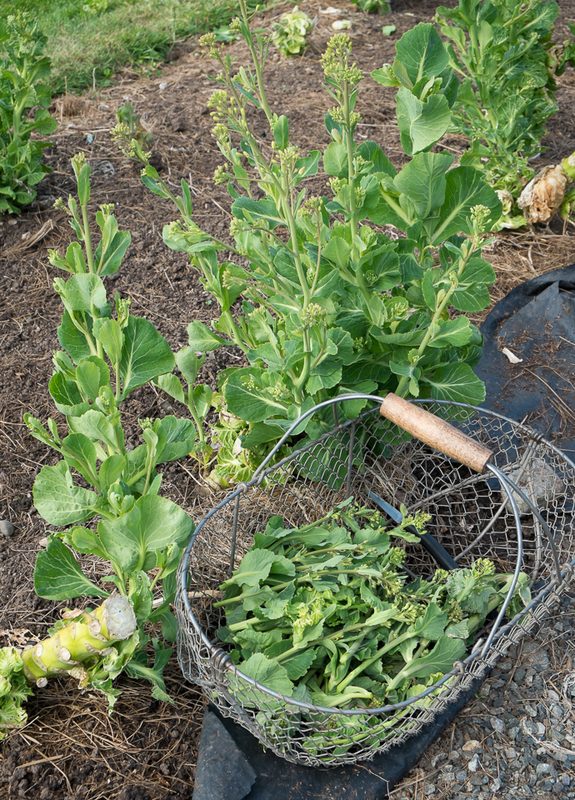 Like the buds of kale, these other cabbage family flower buds are sweet and tender. Lightly steamed, they are delicious; sautéed in olive oil, garlic and red pepper flakes they are even better. 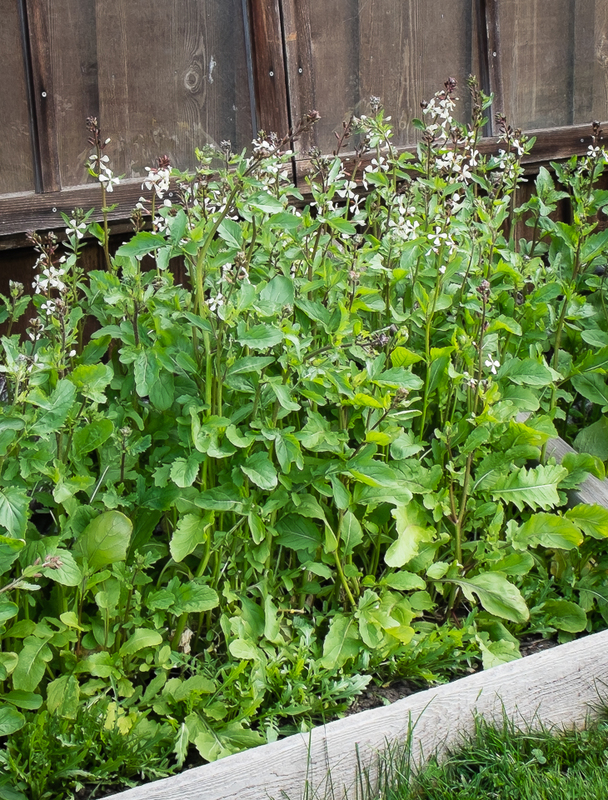 There are many more arugula blossoms than I could possibly use but I’ve left them all blooming anyway. 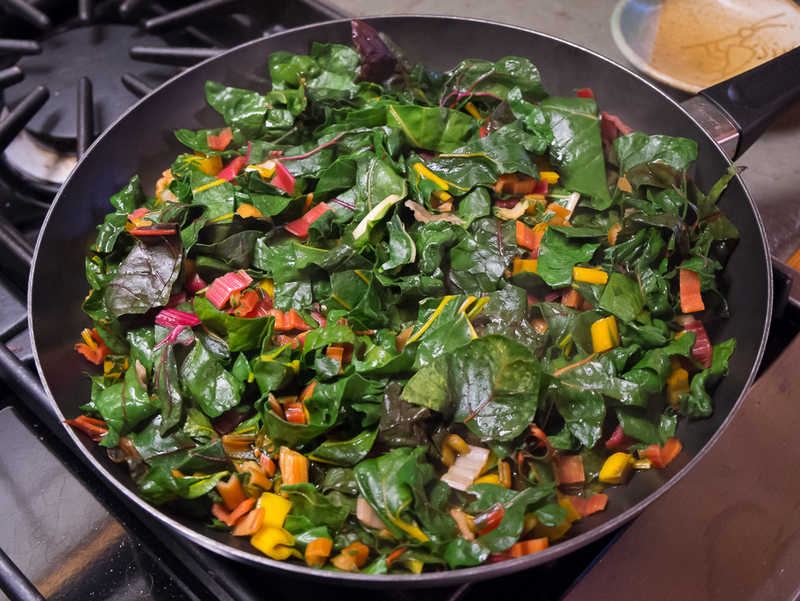 They make a lovely garnish—I scattered them over a frittata the other day—and their subtle, sweet flavor, less spicy than the leaves, is a great addition to early spring salads. These buds and blossoms are a short-lived treat, the last gift of the winter garden. In a week or two we’ll have eaten them all and I’ll finally pull the plants to make way for spring and summer crops but for now we’re enjoying them.